The number of maps included in Modern Warfare 2's upcoming DLC pack, along with its cost, have been revealed. Last week, Infinity Ward and Activision announced that a new map pack called the "Stimulus Package" for Modern Warfare 2 would be released on March 30, but didn't provide any other details. Those details have now arrived, courtesy of an early Xbox Live posting (followed by a removal) with confirmation by Infinity Ward's Robert Bowling on the Major Nelson Podcast. The Modern Warfare 2 Stimulus Package will be exclusive to Xbox Live on release and will cost 1200 Microsoft Points ($15). As Major Nelson humorously said, after the Stimulus Package's exclusivity expires it'll go "wherever else it goes after that," as the man may not be able to say PlayStation 3 without burning into flames. The length of exclusivity was not mentioned. Five maps are going to be included: three brand new and two from Modern Warfare that have been "slightly reworked" according to Bowling. The new maps are called Bailout, Storm, and Salvage. Bailout takes place in a modern-day, burned-out apartment complex. Storm is a weathered industrial park littered with heavy machinery. Salvage is a snowy junkyard fortified by stacked debris and crushed cars. The two maps that make a return from Modern Warfare are Crash and Overgrown. 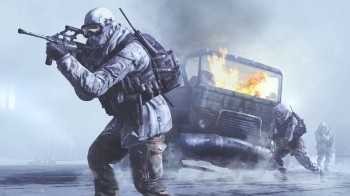 Infinity Ward didn't make any major geography changes to the maps or "re-do" them, but Bowling said that the developer did "up" the graphics and added the basic updates included in Modern Warfare 2 as a whole. Well, does this information give anyone out there mapathy or not?